The station instructions were straightforward and I was easily able to adjust the bike so that I fit on it comfortably. Several mornings that week, I rode a 6-10 mile loop along the river, and crossed into D.C. to ride past the Lincoln and Jefferson Memorials. A couple of small things I didn’t enjoy so much were my not having a helmet (I always ride with one at home), and the bike’s pedaling and shifting took some getting used to. These are bikes designed for short trips around town, rather than for longer rides like my bikes at home…so once I accepted that, I was able to enjoy the ride and the sights. I thought the price was right (including my ‘membership fee’, I paid less than $10 for each ride. I would probably use it again in other cities, though I would hesitate to ride on streets without a helmet. 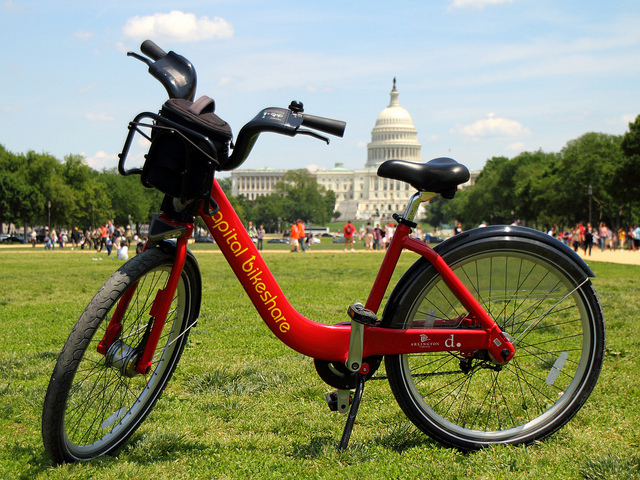 Would you like to send us a Bike Share Review? Read what we’re looking for here, and send an email to curbingcars@gmail.com. Photos and video are welcome, too.